(Glasgow,Scotland) – The UK’s first experiential craft brewery, founded with an ethos to collaborate, curate and cultivate has made its debut into the canned beer market. Drygate Brewing Company saw volumes more than double to 4,700 hectoliters last year and is on track to pass 10,000 hl in 2016, with the move to canning part of its growth strategy. Always focused on breaking down the barriers between brewer and consumer, the Glasgow brewery moved its small batch studio range to cans to meet consumer demand, while importantly highlighting the symbiotic relationship between art and brewing by featuring psychedelic character based artwork by former Drygate van driver turned freelance artist, John Felix. 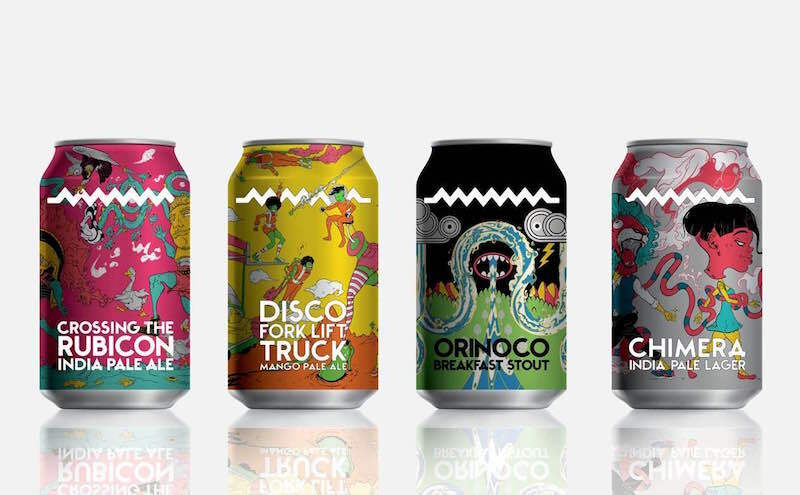 Four beers will now be sold (RRP £2.25) in cans across the studio range, which is comprised of Chimera India Pale Lager, Crossing the Rubicon India Pale Ale, Orinoco Breakfast Stout and Disco Forklift Truck. “Now in our third year, Drygate’s mission to collaborate, curate and cultivate continues by driving forward experimentation and innovation. That’s why we decided to say ‘yes we can’ to meet growing consumer demand, not only as part of our growth strategy but so that consumers can enjoy Drygate’s beer in more accessible ways that protect the quality and prolong the freshness of the beer. The national launch of cans to independent retailers reflects the small batch nature of the brews and Drygate’s prioritisation of more experimental and innovative beers. The can artwork, designed by Glasgow-based artist John Felix, is psychedelic, abstract character based art; it is as much a treat for the eyes as our beers are for the palate. The can designs jump off the shelf, with the colour scheme reflecting the beer range’s fruity and exotic flavours. Moving forward, we expect our cans to contribute roughly 20 per cent of the volume we produce. It’s an exciting time for Drygate as our on-trade footprint continues to grow with new distribution deals across Scotland and the rest of the UK, as well as increasing exports to Europe.